Kill the daemon! Snow-by-Night suffers the Morantine counter attack on Chapter 13 Page 23. Does brass disrupt Snow’s incarnation? Hmmmm. Interesting. You can see Snow’s response when you vote for Snow by Night on Top Web Comics! 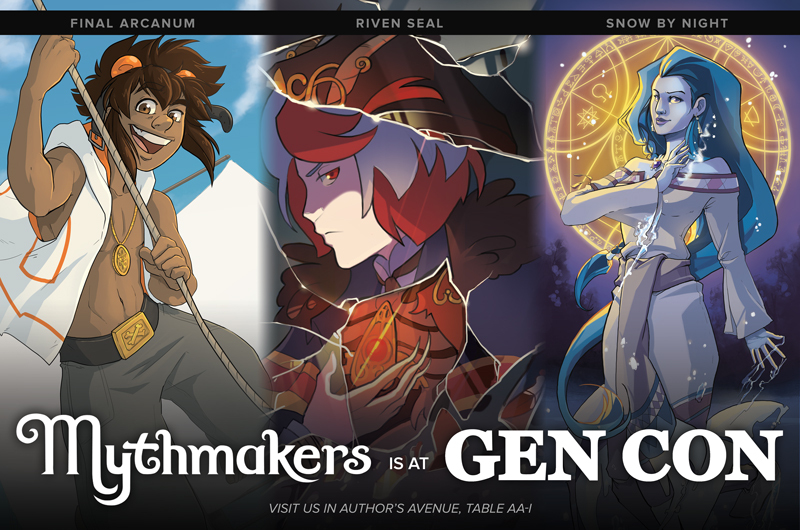 We’re off to GenCon tomorrow! Since the entire team (and I mean all of us — Julie, Diane, Steph, AND me) is going, we’re going to take a short break from posting pages until next Wednesday August 10. I’m sorry for the mini-hiatus in the middle of a fight scene. If you’re coming to GenCon (and probably about 65,000 of you are), please come by and say hello. We’re in the Author’s Avenue at Table AA-I. 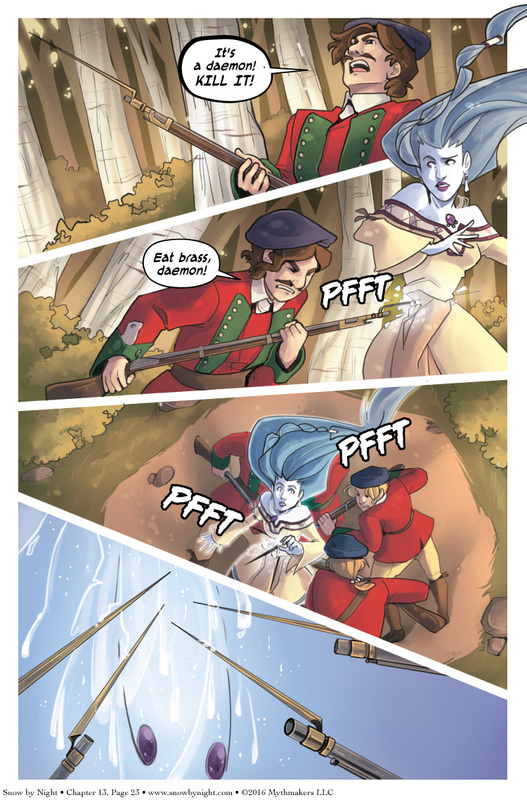 We’ll have Snow by Night, Riven Seal (Julie’s comic), and Final Arcanum (Steph’s comic)! Shouldn’t at least one of you be concentrating on the guy with the bog knife and the silly haircut? I actually like bog knife better. Like, it was made from bog steel, a type of iron you can only dig out of a cranberry bog. Which makes Defieant Elk sound like even more of a bad@$$. Oh look they’re Occupied. Let the back-stabbery commence! Haha! That is a perfect description of her expression. I’m surprised that actually worked. I thought it was iron that fae folk had a severe allergy to? Interesting. Why brass, I wonder? Does brass have an association with fire? Or is it just any fire-forged weapon? Hmm. Brass is made from copper and zinc, That’s probably why. Huh. Thought it was copper and iron that supernaturals couldn’t stand. Copper and iron are more of a European thing, while the Native Americans probably held brass in their belief systems. The Redcoats here seem to have figured that out.